Today a new ship was launched to the Volga river. The experienced sailors didn't conn the ship. Young sailors did that. There were a dress uniform, an orchestra and invited guests. There has not been such solemn event in Children's Sea Center after Ushakov yet. And only because the young sailors were presented with a ship. Tuesday, September 29, 2009 in News. You can comment (we have one response). Parks, parks and parks. There are lots of parks in Yaroslavl which are very green and beautiful either in summer and winter. You can just talk a walk or run in a circle. But there are more interesting things which have been realised by Architecture of Movement organisers. Three times during this September — 6th, 13th and 27th — there were great performances directly in parks. Dancing, music and light show with some hand-made activity were in Yaroslavl when citizens have gone to the parks. We know that in Europe and US it is common to be in a green park and just sit on grass. But for us it is very uncommon and a new experience. That is why we want to change parks and make them better for leisure. Time will show and now you can see photographs from these events: 6th, 13th and 27th of September. Monday, September 28, 2009 in News. You can comment. Another interesting event was on 16th of September. As all events of September, this one was also provided by Architecture of Movement. The name of the quite amazing performance was "Jazz na Svobode" (either Free Jazz and Jazz at Large, a Russian pun). 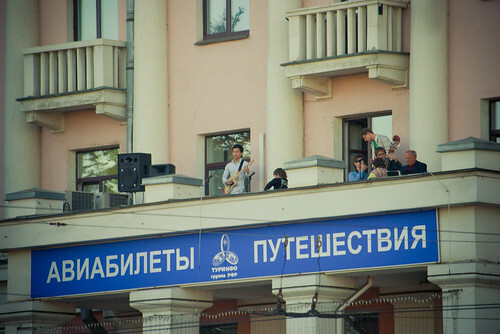 The main idea was to play jazz on the balcony and in the same time passersby can't see an orchestra. They only should listen to free music, jazz music, street music. As if the music was from air. People heard the music but could not understand where it came from. 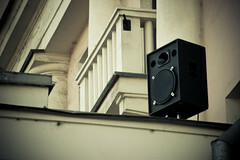 It was city filled with beautiful sounds. Everything was fine. You can make sure of this yourself. Wednesday, September 16, 2009 in News. You can comment. The modern state and Global security is the name of the greatest conference ever which took place in Yaroslavl yesterday. 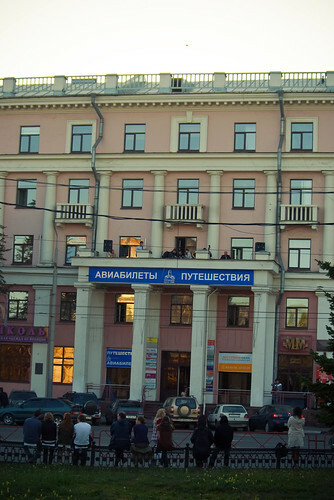 September 14, 2009 International Conference “The Modern State and Global Security” organized and held under the aegis of the President of the Russian Federation Dmitry Medvedev will take place in Yaroslavl, Russia. The Key topic of the Conference is what the modern state should be like, how should it act and progress in order to make the world a safer and more sustainable place. What actions should the modern state take against terrorism, separatism and xenophobia, present threats to the common good. There were more than 550 participants including our president Medvedev, Spanish Prime Minister Jose Luis Rodriguez Zapatero, French Prime Minister Francois Fillon. There is an interesting connection between Mr. Medvedev and Yaroslavl. I've found it on Russia Today website. President Dmitry Medvedev, who celebrated his birthday Monday, explained to the audience the significance of choosing the ancient Russian city of Yaroslavl, which turns a youthful 1,000 years old next year, as the venue site. “Yaroslavl received its namesake from ‘Yaroslav the Wise,’ a grand prince who was responsible for transforming early Russia into a cultural and military powerhouse,” the president explained. He then reminded the audience that it was “Yaroslav who was responsible for publishing Russia’s first code of laws, which became the basis of Russian statehood.” This little history lesson courtesy of the Russian president, by the way, was probably meant as a dig at those who chastise Russia’s home-grown brand of democracy. After all, should Russians stop drinking kvass just because Coca-Cola is widely available? Probably not. Medvedev also mentioned Yarolslavl’s coat of arms, which just happens to be the bear, an animal that behaves with “force and prudence.” Medvedev said that it is exactly these two qualities that will help the world escape from the clutches of global financial crisis (Incidentally, the Russian word for bear is “medved”). More info you can find on the official website. Tuesday, September 15, 2009 in News. You can comment (we have one response). It is just a simple sentence on the grass which made with people on Moskovskiy prospekt. Stop Crisis or Stop Krizis say the Architecture of Movement to us. Tuesday, September 15, 2009 in Photo. You can comment. There was another event of the Architecture of Movement (I have to mention that all September in Yaroslavl is filled with gorgeous events of the Architecture of Movements). 11th of September there was a ridiculous performance with a Stilyagi theme. Stilyagi (Russian: стиляги, the plural of стиляга, literally "stylish", "style hunter") were members of a youth subculture that existed from the late 1940s until the early 1960s in the USSR. Stilyagi generally opposed the mainstream Soviet ideology of that time and were primarily distinguished by their snappy or unfashionate clothing, considered politically incorrect and contrasting the communist-socialist realities. – say Wikipedia about Stilyagi. Today Stilyagi is a trend because of recently released movie Stilyagi about 1950s life. Our Stilyagi event was nearby Railway Station. Girls and boys were in colourful clothes which looks as real as last century. Dancing and a little bit of those 50's mood. There were old cars – it goes without questions! 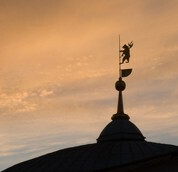 Yaroslavl can also make such great performance concerning with our history. As usual you can see more pictures on the special pages of the project Architecture of Movement. Saturday, September 12, 2009 in News. You can comment. What does the Russian word "Pusto" mean? Yes, I can write it in Russian as "Пусто" but if you don't know Russian, you can't differently say what does it mean. The simple translation of the word is empty. Nonetheless it is a famous street video festival in Russia. Some people try to show some shot (or not) videos for other some people. The main idea is to show all of that in an empty place of a city: derelict houses, desolate places etc. This year "Pusto" has been invited to show some videoart for the Architecture of Movement. There were two performances: in Bragino and nearby the River Station on 4th and 5th of September accordingly. More photographs (as usual) of the Architecture of Movement you can find on the official website and there is the journal (or blog) of the "Pusto" project. I think you can even join them. Sunday, September 06, 2009 in News. You can comment. There are lots of bicyclists in Yaroslavl. They are real fans of that. No wonder that an event of the Architecture of Movement was great and overcrowded. It was the Velopanorama or the panorama of the bicycles. There were a lot of these vehicles on our streets on 5th of September. They started from our Railway station and carried on through Svobody street and Sovetskaya square to another station but River station. Other photographs available on the Veloparoma page. Saturday, September 05, 2009 in News. You can comment (we have one response). This is a new post in our new sub-category of the category News (like Details or Front Doors in Stories). 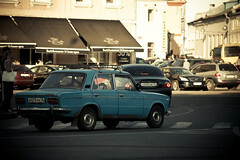 Now we are going to post interesting trends of our city Yaroslavl. Today we want to write about Internet access. 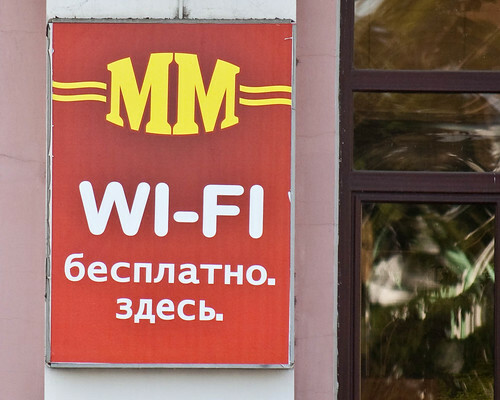 We know that in most European countries there are lots of cafes and restaurants with free Wi-Fi access. In the same time our catering just begins to provide it. Yes, there were some access in the past but it was paid or with some restrictions (speed and so on). 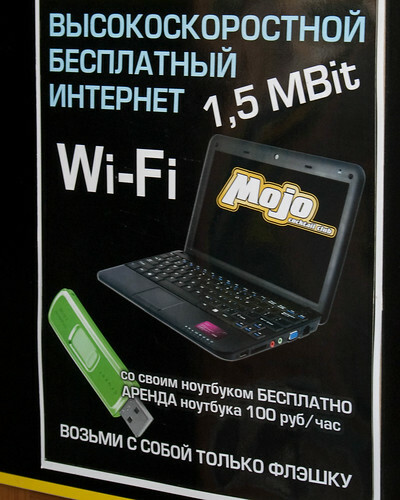 Today we can see sings which say us about good and absolutely free Wi-Fi access. We suppose it's a good practice for our cafes and exactly an excellent trend! Ex'libris is one of the "positive" Yaroslavl music bands which plays music in the pop-rock style. The project was founded in 1995 year by Nikolay Semenyaka. The band was a participant of lots different events like a concert in Olimpiysky, the rock-festival in Maloyaroslavets and many performances in Yaroslavl and Moscow clubs. The music band likes to play optimistic music which put you in a good mood. When the band was forming, many musicians have had a big experience of music performing in other groups. Ex'libris became popular after some merge of two bands in 2000 year. In the beginning of 2007 year under the ridiculous circumstances Sasha (guitarist) knew from bassist Triad about another bassist who wanted to play rock. Though he recently played hard rock in different bands. But nevertheless tastes changed and he decided to work with positive songs. He is Alexey Pechkin. Thursday, September 03, 2009 in Music. You can comment. Do you know about street poetry? Many people think that there are no real poets today. Nevertheless the Architecture of Movement project (which has been mentioned recently) realized amazing poetical evening in Yaroslavl on 2nd of Semtemper. There are lots of ancient arches in the city. They good look and in the same time they are very suitable for some art performances. For example, poetry! In each arch there was a poet who recited poetry. But not only poetry was this day: guitar, songs and even dancing! There are lots of photographs on the official website of 2009 project. Thursday, September 03, 2009 in News. You can comment. Yesterday there was the first performance of the Architecture of Movement project which is organized for the second time. The Architecture of Movement (Архитектура движения in Russian) is a set of different kinds of events, performances and actions. Participants of this project say that the project for them is a festival of ideas. The name of the first event is quite ordinary – Start (which in Russian is Pusk). The main idea was in releasing balloons. Every child, every boy and girl could get an own balloon which had to be released simultaneously with other participants. Good weather, warm and fresh air with a perfect mood are enough to create awesome event! I should mention that September, 1st is a big holiday in Russia with the name Knowledge Day (День Знаний in Russian or Den Znanij with transliteration). It is the day when the school year starts. The whole of September there will be other events of the Architecture the Movement. Lots of photographs can be find on the official website www.armv09.ru. Wednesday, September 02, 2009 in News. You can comment.